For people looking for a powerful carpet cleaner, the Hoover Power Path Pro Advanced Carpet Washer FH51102 might just be the perfect candidate. This advanced carpet washer is equipped with an advanced brushing system, venturing beyond the standard SpinScrub brushing technology that Hoover’s regular machines are equipped with. At the same time, it is also lightweight and easy to handle. The DualTECH Cleaning System is a combination of a strong rotating brushroll and SpinScrub Technology. 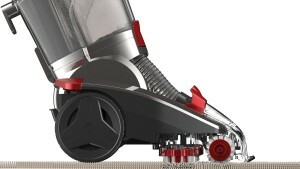 In the past, some users favored cleaners whit a rotating brushroll while others prefer the SpinScrub brushhead system. DualTECH is a unique combination brushing system that includes both styles of brushing! With 10 amps of power, this is a full-powered Hoover upright cleaner suitable for cleaning entire homes and apartments. At this level of amperage, users report good scrubbing and suction power to ensure clean carpets. The cleaning nozzle width is 13 inches wide—enough to cover large areas in a single pass. This patented nozzle also provides even and powerful suction for cleaning areas from edge to edge. 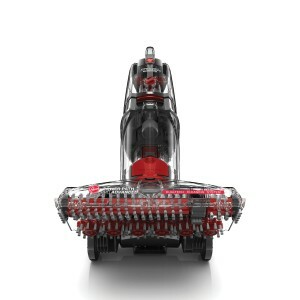 The Dual Tank Technology of the Hoover FH51102 means easier emptying and filling by separating the clean from the dirty water. The washer’s large clean water tank that can house a full gallon of water. Washing and rinsing your carpet is now easy with the Wash and Rinse Mode. All you have to do is turn the dial, instead of emptying (waiting to empty out) whatever is left in clean water tank and refilling it without detergent. 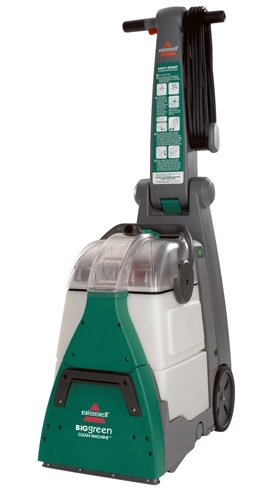 This machine comes with a hard floor cleaning attachment – a Multi-Floor Squeegee. Attach the squeegee and you can use the Hoover FH51102 to clean hard floors. It may be a little tricky to put into place, so some care and patience is needed. With the hose and upholstery tool attachment, this carpet cleaner can be used for cleaning sofas, stairs and even car seats and carpets. The Accessory Tool Pack adds versatility to the Hoover FH51102. Be sure to read through the manual for directions, though. The upholstery tool is not a powered handtool. Assembly of the Hoover Power Path Pro Advanced Carpet Washer FH51102 is a breeze and you don’t even need tools to put it together. At 19 LBS, it is about 5 lbs lighter than the average upright carpet cleaner. As a comparison, it is lighter than the Hoover Dual V, a widepath Hoover carpet cleaner that has been really popular for the past number of years. Comes with a 2-year warranty. This is the same as for the best-selling Hoover Power Scrub Deluxe. In comparison, warranty periods of older machines like the classic Hoover SteamVac with Clean Surge is one year. The Hoover Power Path Pro Advanced FH51102 easily counts as one of the most advanced Hoover carpet washers on the market today (in 2015). The multiple cleaning technologies integrated into this machine makes it a formidable cleaner. It incorporates both the powerful new rotating brushrolls system and the Hoover established SpinScrub technology. It’s been referred to as the new DualTECH Cleaning System. It is arguably Hoover’s best carpet cleaning system to date. There is a tremendous amount of feedback from users on how well this machine cleaned. This positive feedback comes from both pet and non-pet owners. One cat-loving user had not cleaned his carpets in 3 years, and his carpet had accumulated numerous spots from cat vomit. This machine was able to remove them all! In addition, they were able to remove old stains from a white sofa. The user also liked that this machine was easier to move around than a rental cleaner. His enthusiasm for the power of this cleaner is rather typical. Many other users said they were pleasantly surprised (and happy) at how well the cleaner performed and took out old spots. Part of the powerful cleaning results is also a result of the great suction power built into this machine. It means more dirty water gets pulled out of the carpets and dumped into the sink or toilets. 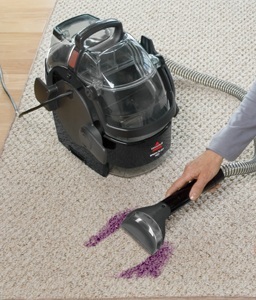 The Hoover Power Path Pro machine will direct hot air onto the carpets to allow it to dry faster. Together with the powerful suctioning, many user reports that their carpets dry in a few hours after using this machine. Introduced in 2014, this machine is designed to be really easy to set-up and use, and comes with some the most useful features available upright carpet cleaners in its class. From the get-go, assembling this carpet washer is so easy. No tools are needed. The tanks are easy to take out, fill/empty and then put back in place. There is a convenient handle for removing the nozzle, so that it can be rinsed in case pet hair or other debris gets stuck. The rinse/wash selector switch makes it easy for users to rinse out the detergent. At 19 lbs, the cleaner is also lightweight compared to something like 24 lbs or more for most full-powered upright cleaners. One lady in her 70s bought this to replace her Hoover MaxExtract cleaner. She was glad because this cleaner did just as well in cleaning the carpets, but it’s so much lighter to handle. Overall, the design is a reflection of Hoover’s years of experience and expertise in making carpet cleaning machines for home users. They know its important to make it as easy to use as possible, without sacrificing on the cleaning effectiveness. 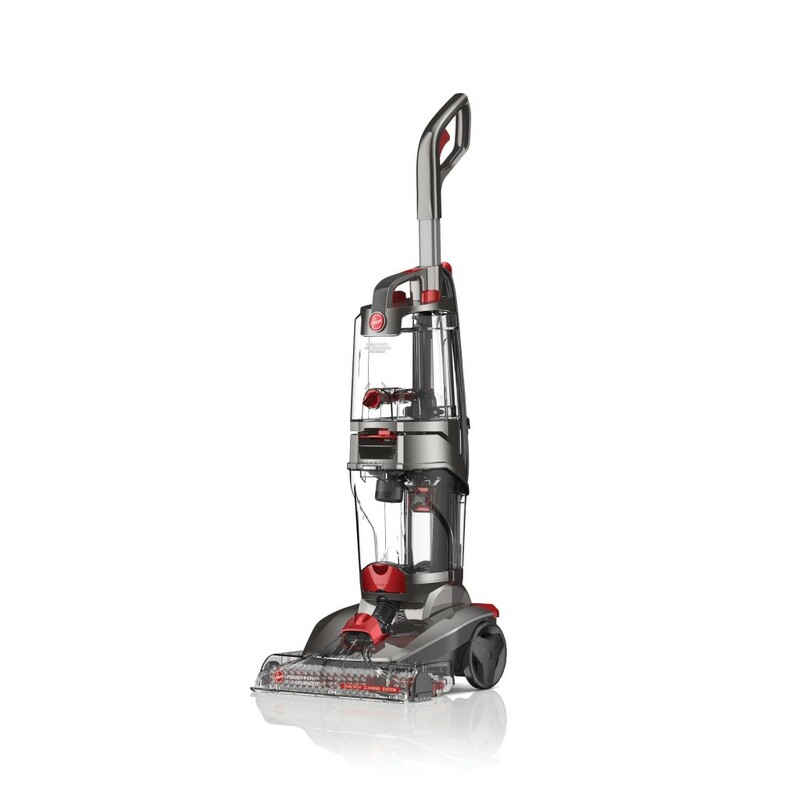 The Hoover Power Path Pro also seems to be better built than the Hoover Dual Power Max and Hoover Power Path Deluxe, both of which appear to have received lower average user ratings compared to this model. If you’ve read through any Hoover carpet cleaner manuals, you would probably know that they highly recommend the use of their own branded detergent with their cleaners. Skeptical users are quick to point out their profit motive. Regardless, Hoover’s cleaning solutions are known for their effectiveness. Since it takes extra time and risk to search out and decide on alternatives, it doesn’t hurt to consider Hoover’s recommended approach. The most popular Hoover cleaning detergents include the Hoover PetPlus Concentrated for really dirty carpets. Another great and less expensive choice that suitable for general cleaning is the Hoover CLEANPLUS 2X solution. If you have stains, do remember to pre-treat them by dabbing on the solution or spraying extra detergent on the spot before you use the cleaning machine. Should You Buy The Hoover Power Path Pro Advanced Carpet Washer FH51102? In summary, the Hoover Power Path Pro FH51102 offers an outstanding cleaning performance that is powered by advanced Hoover cleaning technologies. The Hoover Power Path Pro Advanced Carpet Washer FH51102 is best recommended for the home user looking for a premium all-in-one carpet cleaner for cleaning both small spots and wide areas. It works very well for both pet and non-pet owners who like to keep their carpets absolutely clean and fresh smelling. At the same time, it is light in weight, and very easy to handle and use. For additional comparisons, look at the List of Best 5 Machines on the Carpet Cleaning Machines Reviews page. The gasket problem doesn’t seem to be addressed in any of Hoover’s instructional videos. Hoover, please take a look at the unsealable gasket and help us solve the problem (other than returning the machine which I am reluctant to do). Motor bushing totally worn out and roller bushing seized on shaft. Had it for about 3 years cleaned about 400 sg. feet of carpet twice a year. Cant see the quality any more. This machine cleans perfectly. No complaints on that. However the gasket that seals the reservoir is faulty. When the lid is taken off the reservoir to empty the water, the gasket will not seat properly. I have brought the first one back to the store and they gave me an another, but the same problem with the 2nd one. If your motor seizes up due to using it twice a week on shag carpet and you have to find parts to replace any of the internal motor assembly, you’ll have a hard time finding parts anywhere on-line at any of the vacuum repair parts providers. Sears offers the FH51101 (the model down from this one) total lower arm assembly which includes much more than you actually need to replace for a whopping $259+ when you can buy a whole new machine for under $189. Pretty frustrating for those of us that don’t have a problem fixing these appliances by replacing a motor for about $50.